Attractive, compelling, easily consumable —People have come to love Infographics. They simplify data and makes consuming them easier. They are exciting! And they jazz up your eLearning course like few other elements can! Infographics have become a staple for marketers, and we come across them everywhere — however, eLearning designers are still playing catch up. Schedule a meeting with your SME and stakeholders. Task yourself with collecting as much information and data as possible. You will most likely end up with a plethora of materials — ranging from PDFs, Presentations, Word files, Excel sheets, images, audio interviews, and notes. You will need to mine, shred, and polish this material to create concise and meaningful chunks of data — and decide which content is relevant or should be used/converted into an infographic. Sift through the data so that you have the most compelling stats, data, and visuals. Once you’ve gathered the most relevant content to work with, describe your infographic in a single sentence. This sentence is your Infographic’s theme. Stick to one sentence as a RULE OF THUMB. It will limit the amount of information your Infographic will communicate and prevent overload of information (and cognitive effort for the learner). Well-designed infographics do more than dump content into a visual form. Your Infographic must tell a story, where one fact, or data point is connected to the next. This is why you should have a very strong theme (see previous section!). Visualizing how your data will flow is crucial. All the remaining steps will simply polish it. The best way is to write a story for your infograph. To do this, you must profile your learner: let’s say an adult (age 30+), a professional at an IT firm, working as a manager, looking for a course on handling disruptive IT technologies (cloud computing), etc. Tell the story how YOU expect your learner to read through the Infographic. This will give you an idea of which data should come first and which next. It will also show you the best way to display your information (orientation, flow, and placement) and how to display that information (diagram, graphs, charts, icons, etc.). Develop an idea hierarchy. 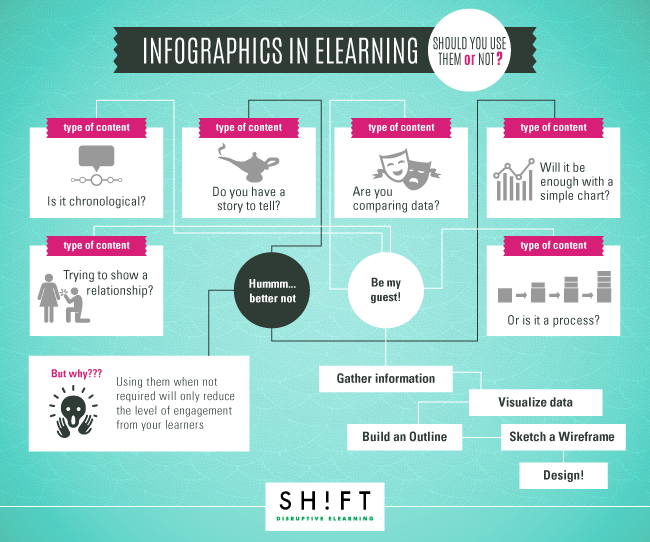 Start with the most compelling data, one that is bound to glue the learner to the Infographic. You might already have an idea of this data (or lack thereof) from the visualization story created in the previous section. Once the data has been analyzed, the most relevant content has been picked, and you’ve determined a hierarchy, you need to draw or sketch a wireframe or flowchart. Label the elements (sections and visuals) and sketch a rough wireframe. Wireframing is like creating a storyboard for an animation or like putting slides from a slide show one after the other. It’s time to use some digital tools to add color, contrast, and typography to the wireframe. The best option would be to pledge yourself to vector graphics. In case you aren’t a graphic designer, here are some interesting, easy to learn, online software. If you are, then stick to your original idea and tinker with your creative hat on!